There was a bad undercurrent in David’s family. David had many children. And they were not united. David’s children did not do right by each other. Ammon took advantage of his half-sister, Tamar. Absalom who was Tamar’s brother, and half-brother to Ammon found out about this. He killed Ammon and then ran away. He was rebelling against his father's authority. David heard of Ammon's death and he was very upset. Absalom decided he wanted more than what he had. 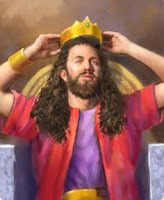 Absalom was a prince because his father, David, was king. It wasn’t enough for him to be a prince he wanted to rule the kingdom instead of his father. 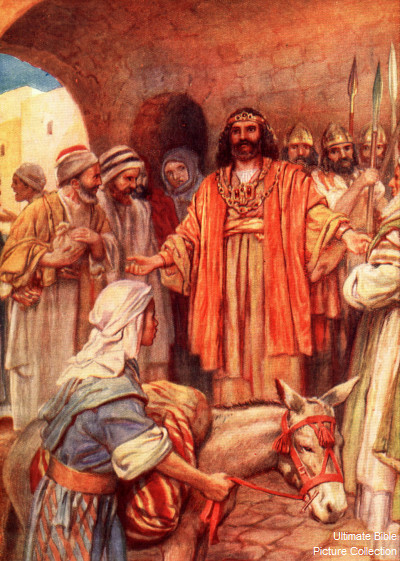 David sent for Absalom but told him to live in his own house. After two years had gone by, Absalom contrived to see his father, David. Joab, David’s right hand man had a field next to Absalom’s field. Absalom caught Joab’s field on fire so Joab would come to investigate. 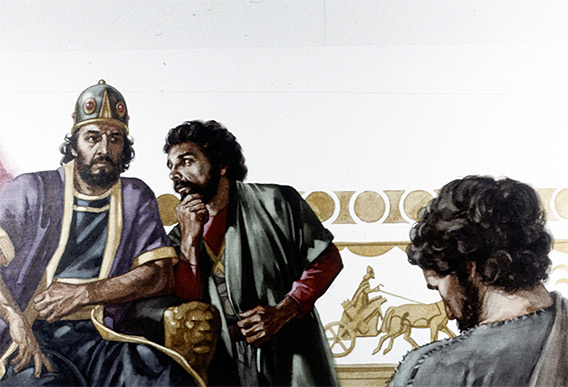 Then Absalom told Joab to tell the king what he did and that he wanted to see the king. David said Absalom could come to see him. David had missed Absalom and he hugged and kissed him. The next thing Absalom did was intercept people coming to see the King. 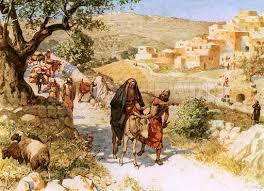 He stood at the gate of the city and pulled them aside instead of letting them go in to see the king. He told them pleasant things and acted like he loved them more than king David did. In this way, he stole the hearts of the people. Then he lied to the king so he could go to Hebron. He contrived for many men to go with him. He was getting a huge following. His goal was to take the throne away from his father, David. Absalom had people call him king of Hebron. He was proclaiming himself to be king. David heard of what Absalom was trying to do and instead of fighting against his son, he and his household left the city of Jerusalem. Many warriors and people went with David. Zadok the priest along with the other priest took the Ark of the Covenant with them as they left. While the people were leaving the city, the priest made sacrifices to the Lord. David told Zadok to take the Ark back to Jerusalem and said if the Lord is pleased with him, he will return. David wept all the way up the Mount of Olives with ashes on his head and barefooted. He mourned because of the rebellion of his son. The people with him did likewise. There were men along the way that were unkind to David but David would not let his men do anything to these mean spirited men. When they got to their destination, they were exhausted but David refreshed himself and went to the Lord in prayer. Psalm 3 is that prayer. David had a special friend who went to Absalom’s side to give different advice than Absalom would get from Ahithopel his adviser. In this way, the Lord frustrated the good advice of Ahithopel in order to bring disaster on Absalom. The continuing story will be in the next blog. In it we will learn of Absalom’s fate. Memorize part of the Psalm David wrote: Psalm 3:3-5 But You, O Lord, are a shield for me, my glory and the One who lifts up my head. I cried to the Lord with my voice, and He heard me from His holy hill. I lay down and slept; I awoke, for the Lord sustained me.